Lighting and Productivity: What’s the Connection? When it comes to maximizing worker productivity, creating a good work environment is essential. Businesses that are able to foster greater productivity among employees can offer better services to clients and generate higher revenue. The question is: How do you create a positive and productive work environment? The answer is more straightforward than “a ping-pong table in the break room.” If you want productive, positive employees, there’s one thing you have to remember: Don’t leave your employees in the dark. No, seriously. The quality and type of lighting in a workspace can have measurable effects on productivity and overall well-being, according to the UNC Kenan-Flagler Business School. Imagine yourself at a cubicle, in a dimly lit room with fluorescent tube lights flickering above you. There are no windows. How well are you working in this scenario? It may sound like the stuff of nightmares, but it could very well be someone’s actual office space. If you’re concerned about how your office lighting might be affecting your workers’ productivity, there are solutions. Whether you are a founder of a brand new business or the owner of an established one, there are steps you can take to make sure that the lighting in your office is helping your employees reach their full working potential. Natural light is highly coveted in our homes, and it should be considered just as important in our workplace. Exposure to natural sunlight has been found to be especially beneficial to office workers. Those exposed to daylight for longer periods tend to exercise more and sleep better. In one study, workers who sat near a window slept an average of 46 minutes more each night than those who did not. In turn, sleep and exercise increase the health and mental function of your employees, which in turn leads to fewer errors and accidents on the job. All of this contributes to the overall safety and well-being of your office community, which in turn increases productivity. Place your employees close to windows in your existing building, or, if you are searching for an office, make natural light a priority in your new space. Designers should be incorporating a lot of glass in their plans for office buildings as well. 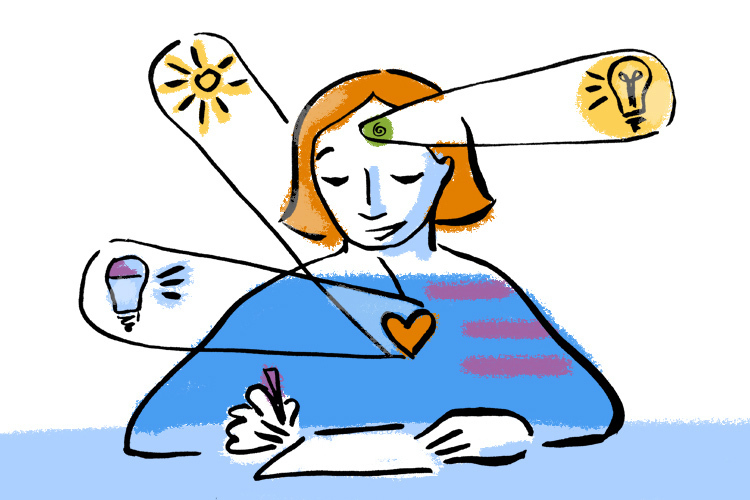 Every little bit of natural sunlight can help your workers be happier and more productive. The temperature of light—measured in Kelvin (K)—is a numerical measurement of the color that’s emitted when an object is heated to high temperatures. As the temperature increases, an object changes colors and emits light in those colors. Take, for example, an iron poker left in a fire. As the metal heats, it will first turn red, then orange, then yellow, and eventually emit a bluish-white color. If you were fortunate enough to have art class in elementary school, you might have heard colors referred to as being “warm” or “cool.” Warm colors include red, orange, and yellow; these warm colors are lower in temperature than cool colors, which lie at the violet and blue end of the color spectrum. Studies have found that blue-enriched light bulbs, which measure about 17,000K, can mimic the effects of natural sunlight when it comes to health and productivity. In one study, researchers found that workers exposed to blue-enriched bulbs reported feeling happier and had less eye strain. The blue bulbs support alertness by lowering levels of melatonin, the hormone that helps us go to sleep. 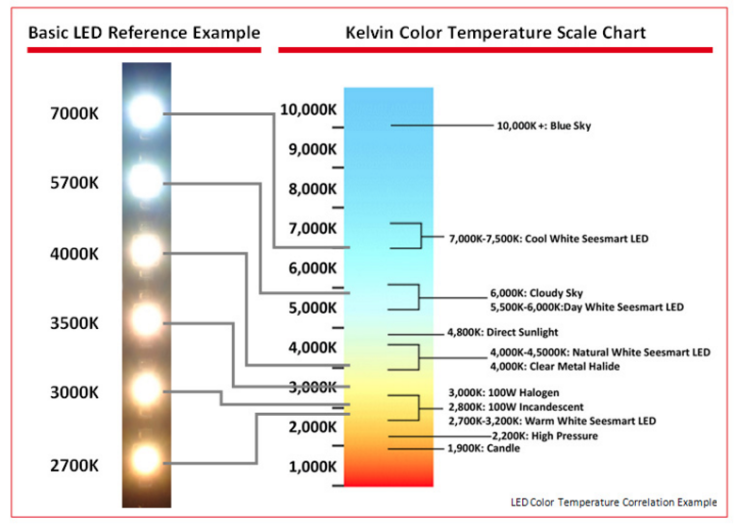 Take a look at the Kelvin Color Temperature Chart from See Smart LED’s website. While the blue-enriched bulbs can help keep employees alert and productive, they may not be the best choice for areas in the workplace where you want people to feel more relaxed and comfortable, such as a conference or break room. Unfortunately, there is no one type of light that is best for an entire office. Instead, employers should be considering lighting plans specially tailored to their office’s needs, based primarily on what kind of activities will be taking place in a given space. For instance, because of its positive effects on alertness and cognition, blue light is good for spots like desks or rooms where workers need to brainstorm. For spots that require a more intimate tone or feelings of trust, consider “warm” light, which has been found to instill feelings of comfort. This might be more useful in areas of the office where employees congregate for meetings or to relax. Many designers anticipate that office lighting will soon be highly programmable, allowing users to change the type of light in any given part of the office to fit the demands of the space at that time. Some companies are already taking advantage of this, with practices as simple as having lighting that starts cool early in the day, and then transitions to warm as the day progresses, essentially mimicking the progression of natural sunlight—and we know how great natural sunlight is for worker productivity. Wherever you find yourself in the debates over office design, make sure you are considering your lighting situation. Strategic lighting can and will have more power over the workplace in years to come, and the most innovative companies will benefit from these insights. The key to maximizing worker productivity could be as simple as changing your light bulbs. Molly Greenberg is the community content manager for MBA@UNC, UNC Kenan-Flagler Business School's online MBA program. Molly was named one of Washington's 100 top tech leaders by the Washingtonian in 2015 for her in-depth media coverage of the business of higher education, education policy, education technology, and startups across the Washington, D.C., area.